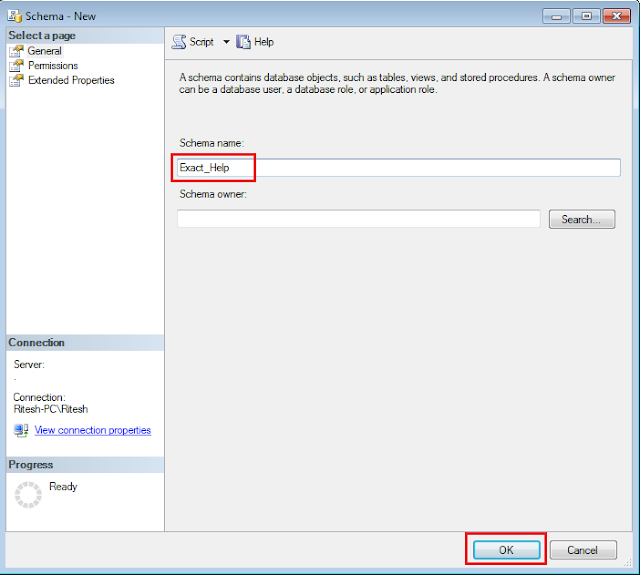 In this article we will walk through Create or adding schema, Default schema, Alter or change schema, show the schema, Drop schema, change schema owner,find schema etc in sql server 2005,2012, 2014. What is schema in sql server? Schema is container of database objects like table, view, stored procedures etc. In simple word a database can have more than schema and a schema can have more than one tables, view, procedures etc. 2. Right click on schemas and choose "New Schemas ..."
3. Write any schema name and click on OK button. Default schema means if schema name has not specified in the object name then in which schema sql server will search first. Default schema depends upon sql server user. Sql server will search the objects in schema dbo if it doesn't find it in default schema of user. --Creating user with default schema "Exact_Help"
Creating two tables in the schema dbo and Exact_Help respectively and inserting some records into it. 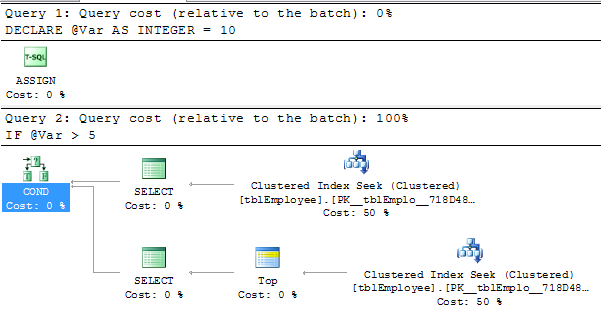 In which schema it will search the table tblEmployee? Will we get error message? How to move or transfer table from one schema to other ? 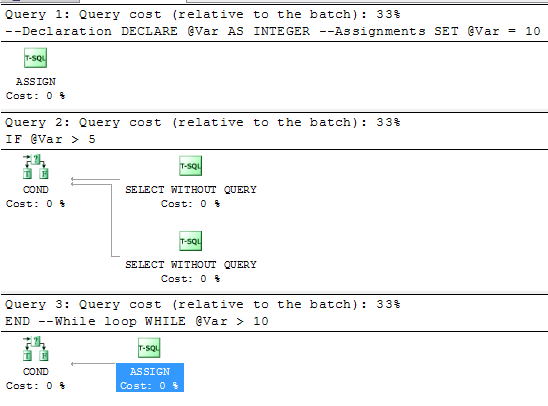 Note: To get the actual plan, first enable the actual execution plan by using any above methods then execute the query. You will get a new tab "Execution Plan" in the query result window. Why there are two types of the execution plan? 1. Any INSERT, UPDATE, DELETES or MERGES statement in a live server which can modify the tables. 2. A SELECT statement which takes too much time to execute the query. 3. A complex stored procedures in which we are not sure that execution will affect the application or not etc. 1. Not executing the query: It is called estimated execution plan. 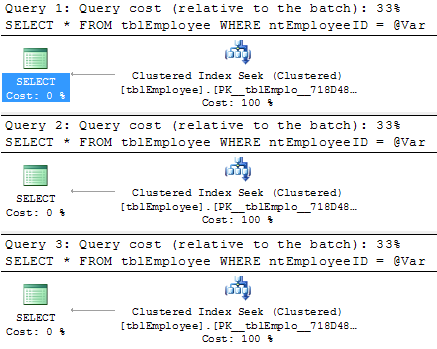 As the name suggests SQL server query is guessing or estimating that query may follow this execution plan when SQL server will execute the query. 2. Executing query: It is called actual execution plan. 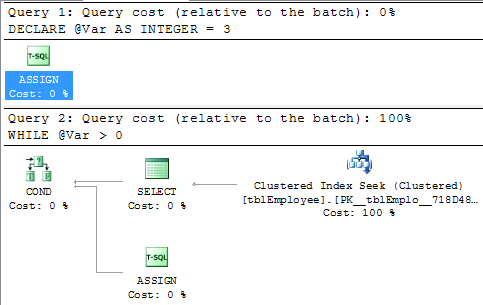 As the name suggests it is actual execution plan, which SQL server has followed to execute this query. f. A Select statement without from a table etc. It is generated the estimated execution plan for each language elements while SQL server will not generate any actual execution plan of the language elements. Instead of validating the IF condition estimated execution plan has generated for both IF block as well as ELSE block. Actual execution plan has first evaluated the IF condition and generated the execution plan of only that block which satisfies the IF condition. In the above query WHILE loop will iterate three times but estimated execution plan doesn't evaluate it. If we will try to generate the estimated execution plan we will get an error message: Invalid object name 'tblStudent'. It will delete 671 records from the table. Sometimes we may get different estimated and actual execution plan due to not updated statistics. In sql server we can compile any sql server quires without executing it by setting the property NOEXEC. When we will execute the above query first it will compile then execute it . When we will execute the above query it will only compile. 1. To check the synax of sql statements. 2. To check the existance of objects. 3. To debug the batch of quries. Scope of NOEXEC property is within a session. In other session we have to set the NOEXEC property once again. 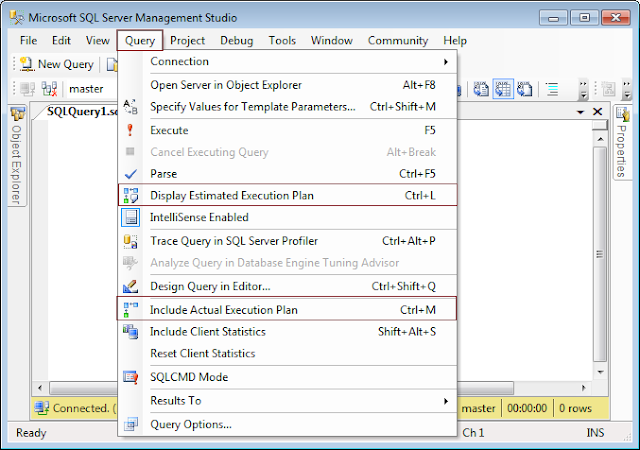 Note: When we login or open a new query page or tab we creates a new session in sql server.